A number of genetic risk variants, including APOL1 and UMOD, have recently been identified using a variety of genetic tools. A Core Curriculum on this topic published in the May issue of the American Journal of Kidney Diseases discusses how novel genetic tools are being used within this growing field. Corresponding author Dr. Anna Köttgen (AK) from Freiburg University, Germany, discusses this topic with Dr. Matthew Sparks (eAJKD), eAJKD Advisory Board member. eAJKD: Can you briefly describe an example of a monogenic kidney disease, and what standard approaches are used to identify novel mutations linked to kidney disease? AK: The most widely known example for monogenic kidney disease is autosomal dominant polycystic kidney disease (ADPKD). Other examples include nephronophthisis or cystinosis. When a patient has a suspected monogenic kidney disease, you first sequence a candidate gene-set. However, when you suspect that the patient has mutation in an entirely novel gene, then identification of the genomic region using linkage analysis or homozygosity mapping is performed. Next, the responsible gene mutation in this region is located by targeted sequencing with follow-up functional experiments to verify significance. More recently, there are more modern approaches such as whole exome sequencing that have become widely available. By using whole exome sequencing you could simply scan the entire protein coding part of the genome, which is called the exome, for mutations rather than concentrating on a specific region. eAJKD: There has recently been a lot of discussion about GWAS studies in the literature. Using GWAS, gene variants such as APOL1 and UMOD have been linked to kidney disease. Can you discuss these studies? AK: An important finding in nephrology in recent years was the identification of the APOL1/MYH9 locus as an important genetic risk locus for kidney disease among African Americans. This research was initiated to examine if there is a genetic contribution to the observed disproportionate burden of kidney disease among African Americans. The genetic region around the APOL1/MYH9 region was then identified by a technique called MALD. Over the past few years, it has become clear that the population-attributable risk for kidney disease among African Americans due to genetic variants in this region may be up to 70%. The genetic variants increase the risk for non-diabetic kidney disease, FSGS, and HIV-associated nephropathy between three to almost 30-fold. What’s interesting to the clinician is that a substantial proportion of what was previously termed hypertensive nephrosclerosis among African Americans can in fact be attributed to risk variants in this region. The underlying pathophysiologic mechanisms are not yet understood, but a plausible hypothesis highlights the ability of these genetic variants to lyse trypanosomes, which may have represented a survival advantage in Africa. Another example of a kidney disease risk gene identified by GWAS is UMOD. This gene encodes Tamm-Horsfall protein, which is the most abundant protein in the urine of healthy individuals. These studies point towards a new and important role of this protein in chronic kidney diseases. eAJKD: What are some of the limitations of GWAS? AK: There are several limitations. First, by screening millions of genetic markers, these studies can only identify disease-associated regions. Because only a selected set of marker variants are genotyped, you don’t look at all variants in the genome. It’s possible that the identified variants are not causal, but rather correlated genetic markers. Even if the causal variant is among the associated variants identified, it can be difficult to pinpoint. This is because there are often many correlated variants in one genetic region. The proof of causality has to be established in functional studies. Finally, most of these identified risk variants have relatively small effects. As such, very large studies containing huge numbers of patients are necessary to fully assess these genetic risk factors. eAJKD: How are these findings currently being translated to clinical practice? AK: Clinical translation is an ongoing effort that starts shortly after identification of risk genes, but can take a very long time before it translates to patient care. Currently, there are a few examples of successful translation into clinical practice. For one, certain genetic causes of FSGS can prevent ineffective steroid treatment in affected children. Knowledge about genetic risk variants can also be useful in patient counseling or risk prediction. The genetic risk variants from the GWAS that I just mentioned have not yet proven useful for risk prediction. As we gain more experience with these genetic variants and a better understanding of their biologic and pathophysiologic mechanisms, this will hopefully translate into clinical practice. eAJKD: Can you give us an insight into the future direction of genetic research in kidney disease? AK: We have had great technical and analytical progress over the last several years. This will allow us to sequence and analyze entire genomes rather, than just concentrating on certain regions. This will lead to additional challenges when it comes to assessing whether or not an identified sequence variant is indeed pathologic. In the future, we will rely more heavily on a bioinformatics-type approaches, in addition to the necessary wet-lab research that is currently being utilized. We also need to better understand the importance and distributions of these genetic risk factors in different world populations and high-risk populations. Finally, at each of these steps, it will be important to keep ethical and societal implications of the genetic research in mind, as these finding could have broad implications for the lives of many individuals. 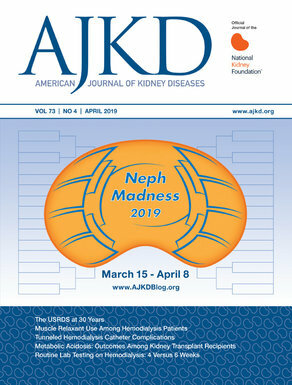 To view the article full-text (freely available), please visit AJKD.org.